Our Private Label capabilities can take your project from product concept to a world-class labeled and packaged product in a matter of weeks. Our logistics team efficiently warehouses and drop ships all over North America to help minimize your operational down times. 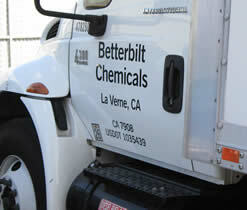 Betterbilt also makes delivery's in Southern California with our own trucks to better serve you. We specialize in bringing our extraordinary expertise and technologies directly to our clients so your corporation can financially benefit from our core competencies. Betterbilt's facilities are equipped with top of the line blending, filling, aerosol and packaging equipment with the capability to store over 100,000 gallons of finished product for our clients. Betterbilt has four decades of experience in handling, blending, filling, packaging and shipping a wide variety of materials. Our filling lines are all custom fabricated with high-end extruded materials and fluoroplastics for long-term durability, performance, safety and ease of maintenance. Products do not leave our facility unless they have gone through strict QC and meet our internal Safety & Packaging compliance that is far more strict than any governing regulatory body. Our priority is to produce a world class product from a safety, environmental and performance vantage point. 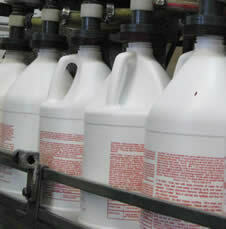 Let us know how our Private label program can benefit your business. © Copyright 2009 Betterbilt Chemicals. All Rights Reserved.